African Wildlife Defence Force (AWDF) have launched an emergency crowdfunding campaign to help save healthy zoo "surplus" animals from the bullet, by sending them back to Africa! Cecil isn't the only lion under threat in Africa. Despite being the iconic symbol of wilderness, lions are on the brink of extinction, with populations declining nearly 60% over the past 30 years. Although the murder of Zimbabwe's most famous lion, Cecil, has brought public attention to the scourge of trophy hunting, there is another threat to wildlife conservationist: the killing of surplus zoo animals. According to a recent report by The Independent, Zoos in Europe "kill 5,000 healthy animals every year." These animals can be adult animals who have been bred with a number of partners and are no longer needed to produce offspring for the zoo. Basically, any animal that does not "fit" into the zoos breeding program can be considered a surplus. Surplus animals can also be animals that the zoo no longer finds profitable, cubs that were a big hit the year before might be replaced by newer, younger animals. Since zoos are not responsible for lifetime care of animals, they can get rid of the animals who are no longer profitable or useful. 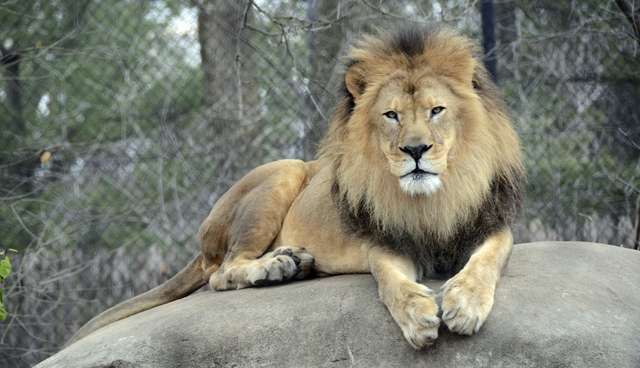 Currently, there are 25 lions mostly males on the international zoo surplus list. If zoos cannot exchange them, they will be killed. The African Wildlife Defence Force (AWDF) wants to prevent this from happening, by purchase these surplus lions and bring them back to a private nature reserve in Africa. To give the opportunity for retirement in a larger environment. The group is trying to raise in the next few days a budget of $500,000 which is necessary to buy, air-lift, and monitor the lions. If they earn more than the required amount, zebra, giraffe, wilddog ... will also be purchased. To donate to the campaign, visit AWDF's fundraising page.